My husband and I have done a pretty solid job of teaching Hunter a variety of tricks over the years. Since a puppy, he’s mastered sit, stay, down, roll over, paw (and other paw), spin, back up, wait, come, and move. He even knows how to give kisses on command. (Yes, it’s every bit as sweet as it sounds!) We’re now thiiis close to consistently checking off what we’ve deemed his who’s-a-good-boy pose in which he sits on his back legs with his two front paws up at his chest, occasionally waving one as if to say I am! Hunter, however, also has us (OK, me more so than his daddy) well-trained. See the examples below. Can your dog high five? It’s actually a pretty simple trick that can be learned easily and incorporated into your pet portraits with these three steps. With a treat folded in your fist, bring your hand near his nose until he paws at your hand. Your dog should remain sitting; if he jumps or gets up to move, go back to step one and try again with him sitting. This may take a few tries, so be patient. Consistency is key and short breaks are a necessary part of learning. 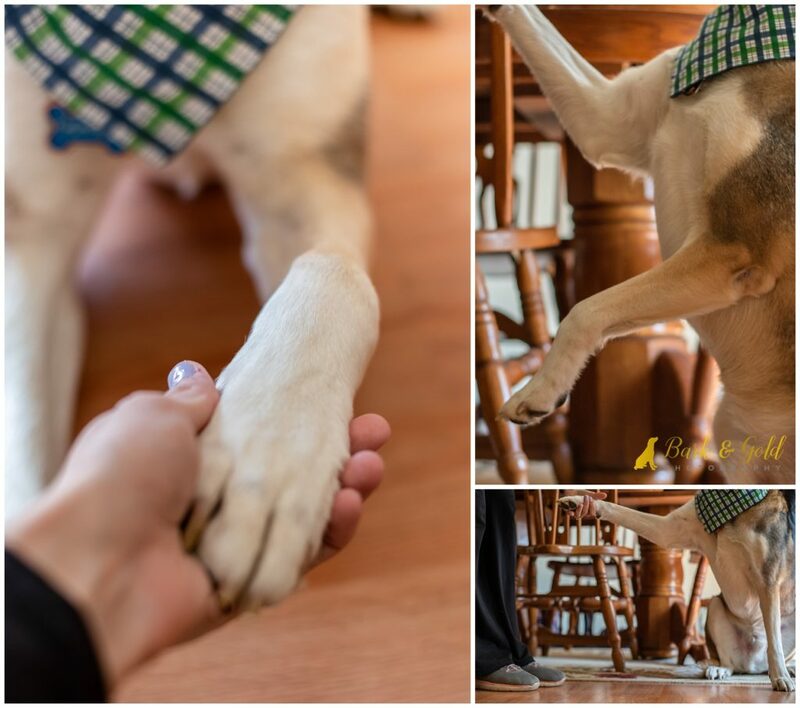 Once your dog is consistently pawing at your fist, you’re ready to open your hand for a high five. The goal is for him to paw your open hand. While it may take some time for him to connect pawing your open hand with receiving a reward, keep at it; say “high five” then praise and reward him when he touches you. Slowly reduce the amount of a treat-based reward and replace it with affection and verbal praise upon a proper high five. With patient, consistent practice, your dog will learn to give a high five on command. Hunter’s bandana is the Navy Traditions style from Three Wags. Shop this Three Wags look and others using our code TWHunter10 and save 10% on your favorite premium bandanas, toys, dog bedding, and accessories.